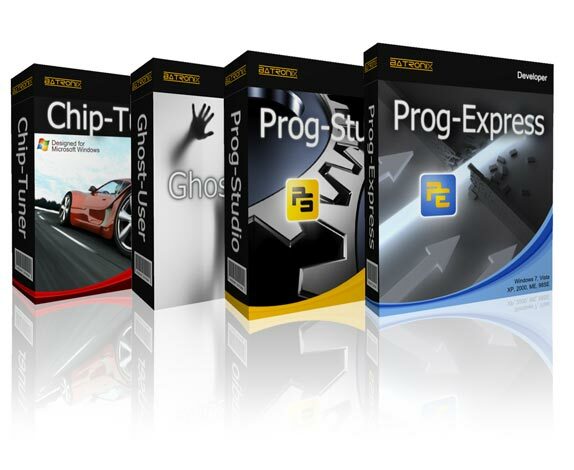 Prog-Express (Freeware) Prog-Express is a modern, intuitive and free of charge control software for the Batronix USB programming devices. Prog-Studio 9 Prog-Studio is a modern, comprehensive and very productive micro-controller development environment for industry standard 8051 (MCS-51) microcontroller architecture chips. Chip Tuner Modul Adds 2D and 3D data views and automatic engine map detection to Prog-Express. Prog-Studio 6 Prog-Studio 6 is only used as control software for the old Batronix parallel port programming devices. All newer Batronix devices are using the free and superior Prog-Express Software as control software. If you are looking for an IDE to create assembler programs for microcontroller use Prog-Studio 9. 8051 Mikrocontroller Instruction Set All instructions of the mcs-51 microcontroller are shown on 79 pages. Geräte Treiber, Software und Dokumentationen Here you can find device drivers, software and documents for all products we offer.